With an installed air cleaning unit working in tandem with your HVAC system, you can make every corner of every room feel more comfortable and healthier. You’ll also keep your air conditioner’s cooling coil clean and your furnace working efficiently, saving energy, minimizing repair costs and extending service life. Whether you want standard air cleaning functionality, or you want 98% effectiveness at removing particles as small as one micron – that’s 1/100th the diameter of a human hair – Aprilaire has the solution that’s right for you. Aprilaire air purifiers are so effective at removing particles and contaminants that are harmful to your family and your HVAC equipment, we offer you this guarantee: Should your new indoor air conditioning coil require professional cleaning in the next 10 years while properly using an Aprilaire air purifier, we will pay $100 toward the cost of having the indoor coil cleaned by a licensed contractor. 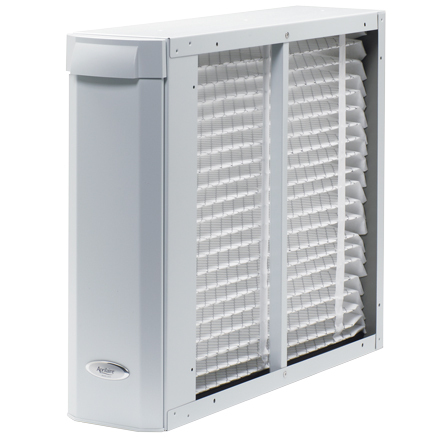 Interested in a Whole Home Air Cleaning Solution?